How technologically advanced were people in Jesus’ time? The people who witnessed Christ’s miracles were probably more sophisticated (and skeptical) than you might think. Reading the accounts of Jesus’ miracles in the Bible, it’s only natural to imagine that the 1st-century Judeans who witnessed them – and the early Christians who believed in them – were probably a gullible bunch of unsophisticated rubes. But were they, in fact, that primitive? A look at the technology available during the first century puts things into proper perspective, and shows that these people were much more “modern” than we might have thought, and they probably greeted Jesus’ ministry with the sort of skepticism one would expect from advanced cultures. In order for people to survive and flourish in the desert, they need water. 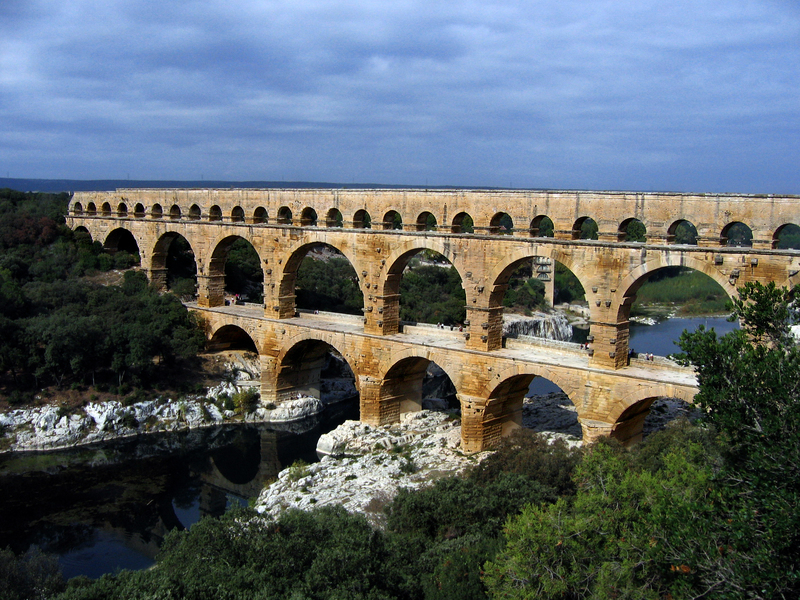 Until the invention of the aqueduct, perfected by the Romans, but first used Minoans in ancient Crete as early as the middle of the 3rd millennium B.C., people had to live in near rivers and streams or in small groups close to wells and spring. An aqueduct uses the earth’s gravity to move water along a channel from its source to distant people, allowing for the growth of cities and the cultivation of agricultural lands. It was no mean technological feat for the Assyrians in 691 B.C. to bring water to Nineveh – two millions blocks of stone were used to build a 30-foot high and 900-foot long channel. In 2015, archaeologists discovered a 2,000-year-old 13-mile long aqueduct in Jerusalem. It was built by kings in the Hasmonean dynasty, who ruled Judea and its surrounding regions from about 140 B.C. to 37 B.C., and was still in use until only 100 years ago. The Roman Empire wouldn’t have been possible without the technological advances in water management it invented. Throughout the city of Rome, and running from Germany to Africa, elaborate, highly sophisticated Roman aqueducts that involved underground plumbing supplied water to millions of people. By the time Jesus was born, the history of writing was well established, as evidenced by the discovery of some 20,000 clay tablets found in Nineveh, dating from the 3rd millennium B.C. The immense Royal Library of Alexandria, built in the 3rd century B.C., is thought to have held between 40,000 and 400,000 scrolls, and helped make Alexandria, Egypt, the capital of knowledge and learning in the ancient world. In 1938, Wilhelm Konig, a German archaeologist working on a dig outside Baghdad, in modern day Iraq, discovered a clay jar containing a copper cylinder covering an iron bar, which some scholars date to as far back as 150 B.C. It was a mystery then, and remains a mystery today, exactly what this discovery actually was, but today archaeologists believe it – and several other similar devices — were early batteries. Scientists such as Dr. Marjorie Senchal, professor of the history of science and technology at Smith College, have created replicas of the ancient batteries and confirm that they produce voltages from 0.8 to almost two volts. “I don’t think anyone can say for sure what they were used for, but they may have been batteries because they do work,” she told BBC News. A recent article at Biblical Archaeology Review examines the history of medicine in the ancient world, and presents recent discoveries that have found that people living in Jesus’ time were more sophisticated that we might have imagined. They inherited the medical knowledge of the ancient Greek and Middle Eastern physicians, who as early as the 5th century B.C. wrote about lancing and draining wounds and using herbs for illnesses and to promote healing and prevent infections. Further archaeological evidence reveals evidence of intricate surgical tools, and even signs of advanced dentistry: an early dental filling was found in a skull dating to about 200 B.C. that was found in a mass grave in the Negev desert of Israel. The Antikythera mechanism was similar in size to a mantel clock, and bits of wood found on the fragments suggest it was housed in a wooden case. Like a clock, the case would’ve had a large circular face with rotating hands. There was a knob or handle on the side, for winding the mechanism forward or backward. And as the knob turned, trains of interlocking gearwheels drove at least seven hands at various speeds. Instead of hours and minutes, the hands displayed celestial time: one hand for the Sun, one for the Moon and one for each of the five planets visible to the naked eye—Mercury, Venus, Mars, Jupiter and Saturn. A rotating black and silver ball showed the phase of the Moon. Inscriptions explained which stars rose and set on any particular date. There were also two dial systems on the back of the case, each with a pin that followed its own spiral groove, like the needle on a record player. One of these dials was a calendar. The other showed the timing of lunar and solar eclipses. As the article notes, it would be another thousand years before civilization again reached this level of technological sophistication. These are just a few of the known examples of technology available to those who lived in Jesus’ time. Rather than think of them as sandals-wearing primitives, one step up from their cave dwelling ancestors, we should remember that they too had seen the great feats of man, and would likely be initially highly skeptical of a man who called himself the Son of God.